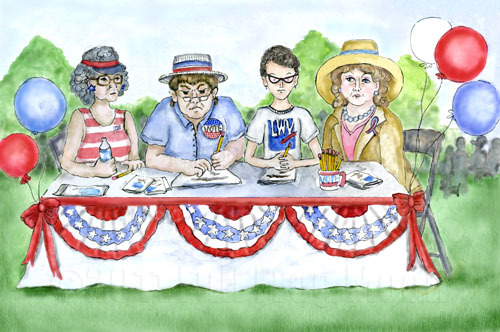 Every year The League of Women Voters sets up a table at our town’s Fourth of July Celebration in the park. It is a festive occasion with live music, barbecue, burger and ice cream vendors, classic car exhibitions, fire trucks and rides for children. The event would not be complete without the tables staffed by volunteers from the two major political parties who hand out literature and free watermelon slices in the hopes of retaining visitors long enough to persuade them that their particular political positions and candidates are the ones to support in forthcoming elections. While I enjoyed the watermelon on this hot summer day, I felt compelled to return to the LMV table. I thought this would be a great opportunity to ask the knowledgeable ladies a few questions about our state’s electoral process. In particular, I wanted them to explain the rational behind the rule that excludes voters who are registered independents from voting in the primary elections. I got the feeling my questions annoyed them and they would rather I just went away.